Doug Casey Warns ‘It’s Going To Get Very Disagreeable In The US At Some Level Quickly.’ California SB1424 risks. 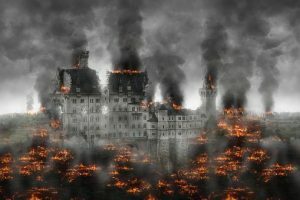 Brandon Smith claims ‘World War III Will Be An Economic War.’ Then there is the Bible. The expansion of the State is definitely destroying society. During the last 100 years the State has grown at an exponential fee, and it’s the enemy of the person. I see no cause why this development, which has been in movement and accelerating for thus lengthy, goes to cease. And definitely no cause why it’s going to reverse. It’s like an enormous snowball that’s been rolling downhill from the highest of the mountain. It might have been stopped early in its descent, however now the factor is a behemoth. When you stand in its method you’ll get crushed. It should cease solely when it smashes the village on the backside of the valley. This makes me fairly pessimistic about the way forward for freedom within the US. As I stated, it’s been in a downtrend for a lot of a long time. However the occasions of September 11, 2001, turbocharged the acceleration of the lack of liberty within the US. In some unspecified time in the future both international or home enemies will trigger one other 9/11, both actual or imagined. It’s predictable; that’s what sociopaths, which I mentioned earlier, do. When there’s one other 9/11—and we could have one other one—they’re going to lock down this nation like considered one of their quite a few new prisons. I used to be afraid that the capturing deaths and accidents of a number of hundred individuals in Las Vegas on October 1st is perhaps it. However, surprisingly, the information cycle has pushed on, leaving scores of significant unanswered questions in its wake. And about zero public concern. A California state senator has proposed a bill “to kill free speech” that would require state-sanctioned fact checkers to approve Web content. The proposal doesn’t mention the First Amendment. The bill is the “Internet: social media: false information: strategic plan,” or SB1424. “Existing law prohibits a person, among others, from making or disseminating in any advertising device, or in any manner or means whatever, including over the internet, any statement concerning real or personal property or services that is untrue or misleading, as specified,” Pan wrote. In lawmaker-speak, the reference to “fact-checkers” means only workers approved by the state. While SB1424 sounds ‘unconstitutional,’ government officials have allowed enough ‘exceptions’ to US Constitutional freedoms (particularly since 9/11) to suggest something like this is possible. With electronic media, “big brother” (the government) can watch you in ways that were not possible in the past. And, perhaps it should be mentioned that conceivably, everyone who posts on platforms such as Facebook is, in a literal sense, a blogger that the USA government may want to monitor (see DHS is monitoring all journalists, bloggers, and media influencers: Will this affect press freedom and lead to the fulfillment of prophecies?). Watch also: Internet Censorship and Prophecy. The Bible clearly tells of a time that will come when the word of God will not be found. And that would seem to be, at least partially, because it will be taken off the internet. In the 21st century, the internet is accessed by people in every country, and thus some type of internet restriction/suspension/site removal is coming–this will one day happen to the Continuing Church of God! And the USA will be part of this. Doug Casey is correct that it will get more disagreeable in the USA. This is part of why we are preparing for the short work the Apostle Paul referred to in Romans 9:28 (see also Preparing for the ‘Short Work’ and The Famine of the Word). But let me add, the USA will then get destroyed per Daniel 11:39 (see also USA in Prophecy: The Strongest Fortresses). Now, everyone does not think that the USA will get physically destroyed. Brandon Smith is correct that liberties are being lost. That is becoming more and more clear to those of us who believe that the Bible is the word of God. Brandon Smith is also correct that we will see a type of economic war. We are seeing the beginnings of international trade and currency wars now. But do not become so complacent that YOU do not believe that a nuclear (or worse) WWIII is coming. The USA is the power with the “strongest fortresses” in the 21st century and is the most indebted nation of all time. The time is coming that the USA and its Anglo-Saxon allies will be no more. The end of Anglo-Saxon economic and industrial dominance is coming. And the Bible clearly teaches that military defeat will occur. 23 ‘The whole land is brimstone, salt, and burning (Deuteronomy 29:23). 6 In all your dwelling places the cities shall be laid waste (Ezekiel 6:6). The time of the Great Tribulation is approaching. Although the USA and its Anglo-Saxon allies are not likely to repent to prevent this nationally, personally you can repent, and hopefully will, well before the collapse of USA and its Anglo-Saxon allies (cf. Zephaniah 2:1-3; watch also: Zephaniah’s ‘Gather Together’ Prophecy). This entry was posted on Thursday, April 12th, 2018 at 2:30 pm	and is filed under Prophecy.